Attack Dog is a Perk in Fallout 4. It is associated with the Charisma Stat. 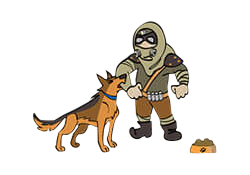 Rank 1: Your faithful canine companion can hold an enemy, giving you a greater chance to hit them in V.A.T.S. Rank 2: When your dog holds an enemy, there's a chance he'll cripple the limb he's biting. Rank 3: When your dog holds an enemy, there's a chance he'll cause them to bleed.